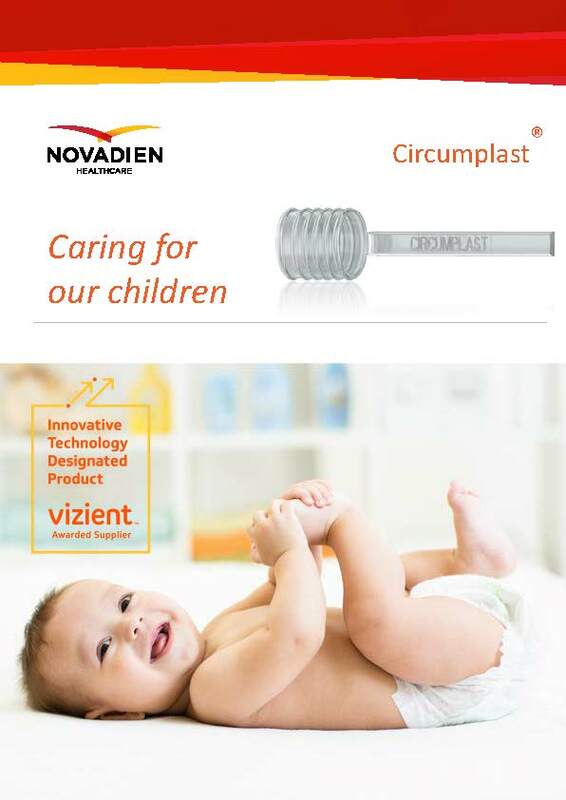 Novadien Healthcare has developed a new circumcision device, Circumplast®. Using our expert knowledge of circumcisions, we were able to engineer the safest, simplest and most efficient circumcision device. We have kept the circumcision process as simple as possible, without the need for any complicated designs which may lead to difficulties during the circumcision. "Circumplast is FDA approved and CE certified"
At Novadien, we believe that the skills of the medical professional should dictate the effectiveness of the circumcision. We have therefore developed a device which aims to compliment the skills of the medical professional in a simple and elegant way to achieve the safest circumcision available. Read more about circumcision. Circumplast® is a sterile single-use circumcision device that is supplied with a ligature. The animation below provides a general overview of the procedure when conducting a circumcision using Circumplast®. The medical professional conducting the circumcision may modify the method based on personal preferences. Mark the level at which the circumcision is to occur. A local anaesthetic may be used at this time. 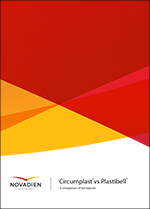 Ligate or electrocoagulate the frenulum vessels to avoid bleeding if desired. Retract the foreskin with the frenulum proximally to reveal the glans and allow enough space for the device to be inserted properly. Insert the Circumplast® device until the coronal sulcus has been reached. Fix the foreskin to the distal edge of the Circumplast® device with forceps (Figure 2). Secure the ligature found in the Circumplast® packaging at the location of the mark made earlier. Break the Circumplast® handle off once the ligature has been secured tightly (Figure 3). Excess foreskin should be cut and electrocoagulated (Figure 4). The device will fall off naturally after several days. The Circumplast and Plastibell methods for circumcisions both have a near identical surgical procedure. The Circumplast was designed by doctors who were fed up with the risks associated with the use of the Plastibell, many of which are well known and documented in the scientific literature. The Circumplast circumcision device provides several locations at which the ligature can be secured. This can be used to choose the amount of foreskin to be removed. The ribs provide further locations for the ligature to be secured and also ensure that the ligature cannot migrate by acting as static barriers. An important feature of the Circumplast circumcision device is the fact that the device is inserted up to the coronal sulcus. This ensures that the ligature can be secured at any location along the body of the Circumplast without inducing any tension in the foreskin. This feature in combination with the distal opening completely removes the possibility and threat of injury due to proximal migration. The frangible joint is the location in which the handle will break off once the ligature has been tightly secured and the handle is to be removed. The joint is specially designed to ensure a clean breakage of the handle to ensure the device does not irritate the patient. The Circumplast handle is designed in a way to ensure there is no contact with the glans. The placement of the handle also simplifies the location of the forceps which the surgeon places to hold the foreskin in place during the securing of the ligature. The surgeon can place the forceps at any location along the circumference of the distal lip or handle, thus simplifying the procedure. The Plastibell handle is designed to act as a location to secure the forceps which hold the foreskin in place during the securing of the ligature. The surgeon must place the forceps on the handle as there is no alternative location at which the forceps can be placed. The following animation is a direct comparison between a circumcision using the Circumplast and the Plastibell.